Las Vegas, February 19, 2000. Mexican warriors Marco Antonio Barrera and Erik Morales collided for the first of three epic ring wars. Morales at the time was the new star of the 122 pound weight class and he was undefeated. He was the favorite in the match-up with Barrera for a number of reasons: one of these being the fact that Barrera has twice been beaten, by Junior Jones; who has actually stopped Barrera in their first fight. These defeats remained vivid in the minds of fight fans, and Morales of Tijuana was expected to dispatch his rival who hailed from Mexico City. What followed 18 years ago today may well have been the greatest fight ever held at super bantamweight. Barrera, having one huge point to prove, fought with a kill or be killed attitude right from the start and fight fans and experts alike watched with their mouths agape as one of the most unforgettable and violent slugfests in the history of boxing took place before them. The momentum swung one way and then the other, with neither man willing to yield. It was breathtaking. Some said later that the fight was a super bantamweight version of Hagler v Hearns – but for a full 12 rounds. It really was was that good a fight, that special. After 12 ferocious rounds, the decision was awarded to Morales, controversially. Many fans disagreed with the decision, yet Barrera, who had fought his heart out, had lost again. Officially. There would have to be a return fight, that much was obvious. But it would be some time before either man wanted to put themselves through such hell again. By the time the rematch rolled around, it was Barrera who was the fighter estimated to be the superior of the two. 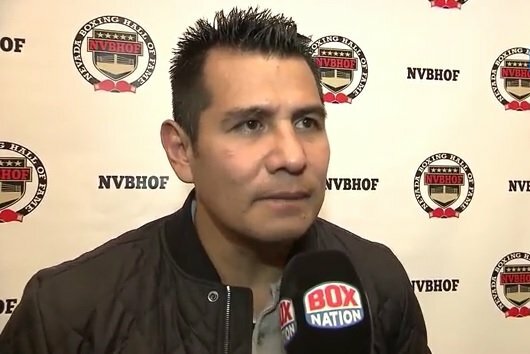 Morales had looked quite ring-worn in his fights with Guty Espadas and In Jin Chi, and he was the underdog going into the return with his arch-rival as a result. The fight that followed unfortunately disappointed many who were expecting another thrilling bout. This time, with his superb boxing skills very much in evidence, Barrera fought smart and picked up the points win at featherweight. As with the first fight, though, the wrong man appeared to get the victory – with most feeling Morales deserved the decision this time. Now all even at 1-1, the rubber match would have to happen. In the opinion of many, the decider between the Mexican rivals was the best fight of the three. A high quality and supremely entertaining fight was witnessed, this time up at super featherweight, and yet again, the action was desperately close. After 12 rounds pulsating rounds, another agonizing wait for the reading of the judges scorecards was endured. Barrera prevailed by a razor thin majority verdict. Morales was bitter at the result and refused to be civil afterwards, choosing instead to try and throw water over his conqueror. There really was some bad blood between the two men. Today, however, the two all-time greats share mutual respect, knowing as they do that they shared something very, very special during the early to mid-2000s. Was Barrera Vs. Morales in fact THE best boxing trilogy ever?